It's raining awesome with @StormCalysta ! When the forecast calls for Storm Calysta, it rains with a vintage diva in a modern world does not disappoint with her charming vintage style and her music. This blog post is a look at someone whom I have been fond of the past few years since first following her work. (Born: February 23, 1993)-year old Storm Calysta hails from Chicago, Illinois, USA; by way of Austin, Texas, USA. Yeah- a Texas girl born in Chi-Town. This major section generally features Storm Calysta at a glance. I think I first came across Storm Calysta on LOOKBOOK. So I obviously became drawn to a hot looking '70s style girl and decide to enjoy her fashion outfits. After all, bells and ruffles never go out of style. 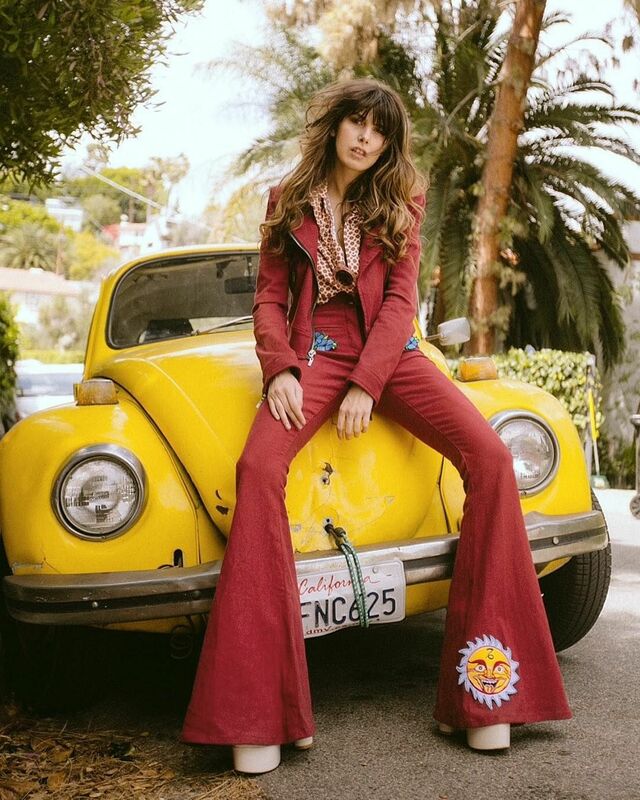 She has modeled for a number of different vintage-type and non-vintage designers including the likes of Rachel Zoe, Free People, and even American Apparel. Storm Calysta, however, is not only a pretty face- she also can strum a mean guitar and drop some vocals. She is an independent (or "indie") pop artist outside of her fashion modeling. By the way, how awesome does Storm Calysta look with this outfit? :) If you like her outfit in the video above, you should see these other fine pictures and outfits on Dazey LA's website: Dazey Lady Feature: Storm Calysta Talks Music - Dazey LA. This is essentially a look at Storm Calysta. What I Would Tell Storm Calysta? If she reads this post, just know I appreciate your work and your amazing sense of vintage fashion style. If your star isn't already shining, you are surely a superstar. Would I Want to Meet Storm Calysta? Learn more about Storm Calysta by visiting her website at www.stormcalysta.com/. You can also connect to her other social media from her site, such as Storm Calysta's Facebook fan page. I hope you all enjoy my work here in this blog and in my other online content. Subscribe and Follow this blog and my others if you like my work and want to be in the know for the Thank you for reading! Take care and be well.